Straight from AFM '11 we have the international poster for BLOODWORK, a film we've been following for quite a while. The film is directed by Eric Wostenbergand stars Travis Van Winkle, Mircea Monroe and Tricia Helfer from BSG. 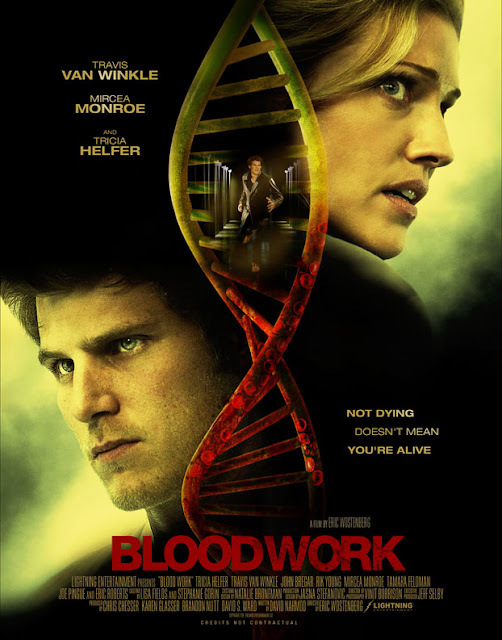 the poster looks pretty cool and throws some DNA mystery into the action which I like! Best friends Greg and Rob, college roommates, decide to earn a little extra cash by participating in a two-week pharmaceutical test over the Christmas holidays. Locked into a remote hospital facility far out in the isolated countryside, they find themselves part of a bizarre series of tests. But as order and control start to break down, it becomes clear that the drugs are having increasingly dangerous side effects, and that no one involved in the test will be safe for long.